(Nanowerk News) A team of NYU physicists has developed a method to monitor the properties of microscopic particles as they grow within a chemical reaction vessel, creating new opportunities to improve the quality and consistency of a wide range of industrial and consumer products. Their work, which appears as a cover story in the journal Soft Matter ("Monitoring colloidal growth with holographic microscopy"), offers benefits for commodities ranging from food and pharmaceuticals to perfumes and cosmetics. "We can now look at each of the particles in a developing dispersion to see how the chemical reaction is progressing and whether the particles are turning out the way they should," explains NYU Physics Professor David Grier, one of the paper's authors and director of the university's Center for Soft Matter Research. Previously, scientists could not look inside a growing microparticle and understand the nature of the material it was composed of--Is the particle fully dense or is it porous? Are all the particles growing in the same way, or are some different from others? "In the past, there was no way to know these answers because we could not characterize particles' makeup," Grier explains. "Now we can." 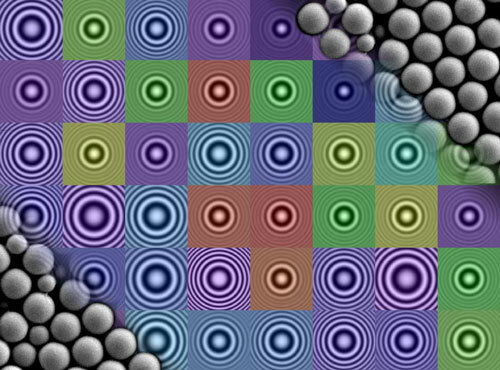 The work reported in Soft Matter relies on a technique, holographic video microscopy, which was developed in Grier's lab at NYU in 2007. It uses a laser beam to create holographic images of individual particles using conventional video cameras and digital video recorders to record the data. The researchers novel analysis of these digitized holograms yields an unprecedented wealth of information about the positions and properties of the individual particles within the sample. This information, in turn, reveals how well the reaction is progressing and what steps should be taken to optimize its products. To demonstrate the capabilities of their technique, the researchers studied the synthesis of crosslinked polydimethysiloxane (PDMS) spheres--compounds that make up silicone. However, Grier says, the procedure could be applied to particles that comprise many consumer products. "If a cosmetics company wants to add a new fragrance to its products or a pharmaceutical company needs to change the active ingredients of a drug, they need to add new chemical compounds," Grier explains. "But how will they interact? How will this change the consistency of the product? And, especially in the case of drug development, will they be effective? "This procedure shows that we now have the potential understand this process at the most fundamental level, which would enhance both product design and production." Holographic characterization provides insights into the properties of products that will enhance their safety, functionality, and consistency, and will reduce costs by improving process control and eliminating the need for trial-and-error testing, Grier says. His group's proof-of-concept demonstration is being brought to the market by Spheryx, Inc., which has exclusively licensed NYU's technology for holographic characterization.